Be your own financial planner. Find out if you can retire comfortably. What do you mean you don’t know? …Actually, it is, in fact, pretty difficult to estimate just how much money you’ll need to save for retirement. I wouldn’t even recommend trying to scratch it out on paper! Thank goodness you won’t have to, when you grab a copy of WealthTrace Retirement Planner! Calculate the probability of retirement success. 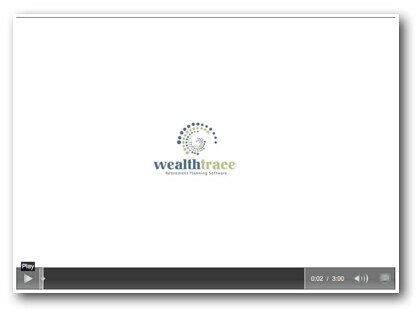 *This is a Web Based Application – Today's "DOWNLOAD TRIAL" points you to a sign up form for a free trial of Wealthtrace. The sign up is quick and easy – You can be working less than a minute. We want people to rest easier at night. There is no need for so many to be so stressed out about their retirement years. - From the Wealthtrace Mission Statement. Save thousands of dollars by building your own retirement plan rather than hiring a financial planner to do it for you. With the WealthTrace retirement planner you have access to the same accurate software that financial planners do, and it is so easy to use that anybody can get started in minutes. The WealthTrace retirement planner is the most accurate and powerful retirement planning application ever built for the individual consumer. It is an online retirement planning solution built for individuals who want to create their own financial plan. Our software will tell you, based on your assumptions, when your money will run out in retirement, what the shortfall will be, and what you can do to change the situation. All of this is done accurately, intuitively, and comprehensively. We at WealthTrace saw a serious need in the marketplace for retirement planning software for individuals who want to create their own financial plan. We have created an easy to use and accurate solution. Quickly and accurately find out what you need to do in order to meet your retirement goals so you can rest comfortably and stop stressing about your retirement years. Ability to enter multiple real estate holdings, each with its own growth and tax rate. Nearly any type of investment can be handled accurately. *For information on how you can get one on one help completing your plan along with real financial and investment advice from our in-house CFA ® and financial advisor, click here. A Financial Advisor is Fed Up! A Chartered Financial Analyst (CFA®), former portfolio manager and financial software developer, Doug Carey decided to try his hand at investment management and financial planning. Little did he know how few solutions there were out there for retirement planning that were analytically powerful, but also easy to use. Days upon days of researching various retirement planning applications led to the same problems. They were difficult to navigate, non-interactive with clients, had limited scenario capabilities, and printed out 50 to 150 page reports with all of the useful information buried inside. It was so difficult to get at the information clients were most interested in, namely, when will they run out of money, how much will the shortfall be each year, and the probability of their plan succeeding. He had had enough and sat down with a team of software engineers to create the WealthTrace Retirement Planner. The overriding goal was to make it so easy to use that both financial advisors and individuals who want to create their own retirement planning could use it. At the same time there was the intent of giving users the ability to find solutions to their retirement hurdles by giving them intuitive, powerful, on-screen before and after scenarios that help guide them towards their goals. Using our retirement planner it is incredibly easy to dial up and down variables such as these to see what you can do today to change your retirement situation. We want people to rest easier at night. There is no need for so many to be so stressed out about their retirement years. We should all be looking forward to relaxing after our work years are over. With the help of the WealthTrace Retirement Planner, many can do just that. Is the purchase price listed one-time only or is it buy then subscribe for access to the product? Thank you.